Have you ever eat "Yudofu"? If you’re starting to get a bit tired from walking around, and you’re going to have lunch in the area, then there’s something called “Yudofu“ that you should definitely try. We introduced Yudofu in Part 1. It has become well-known throughout Japan as a famous specialty dish of the Nanzenji neighborhood of Kyoto. It is a vegetarian dish which has been eaten for many centuries by the monks of Zen temples in this area. Additionally, since this area boasts particularly high-quality water, delicious tofu has been made here continually since the Tokugawa Era. As such, the Nanzenji area is often considered to be the home of yudofu. 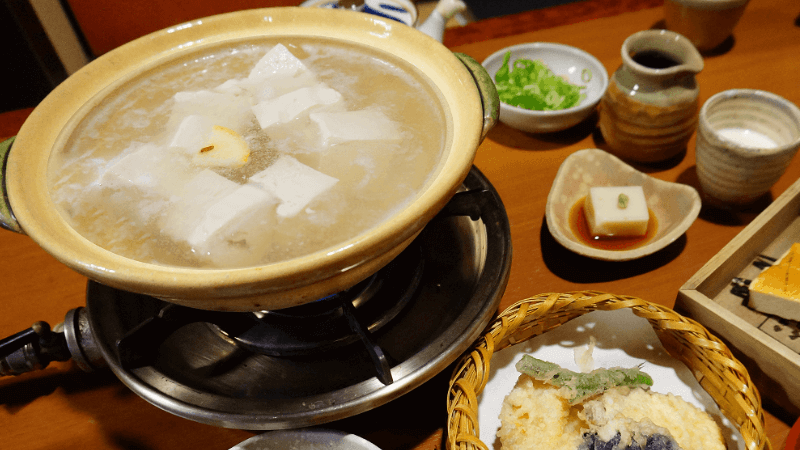 Yudofu is boiled tofu that is carried in a container such as a claypot, which you fish out by yourself and add condiments such as dashi-shoyu (a mix of soup stock and soy sauce). The contents of the claypot may just be tofu, or there may also be cute pieces of gluten that mimics the shapes and colors of seasonal flowers and leaves, or there may be various vegetables as well. Yudofu isn’t something that you can only eat with tofu, either. There’s often a Yudofu-zen set menu, which will usually include Yudofu with other dishes such as boiled dishes, tempura, rice dishes, desserts and so on. In the particularly cold season, Yudofu is a subtle-tasting dish which Japanese people have eaten for many centuries in order to warm their bodies and maintain their health. There are many restaurants which serve yudofu, and we would like to introduce two that we particularly like. When you’re deciding where to eat yudofu, there aren’t that many criteria to think about. We would recommend “Junsei” for somebody who wants to try not only a tofu dish but also experience a lovely Japanese atmosphere. The site is so renown that it is registered as a national Tangible Cultural Property, and the gorgeous Japanese garden which includes several quaint buildings should not be missed. The seasonal scenery will relax away your travel weariness and make you feel at ease. 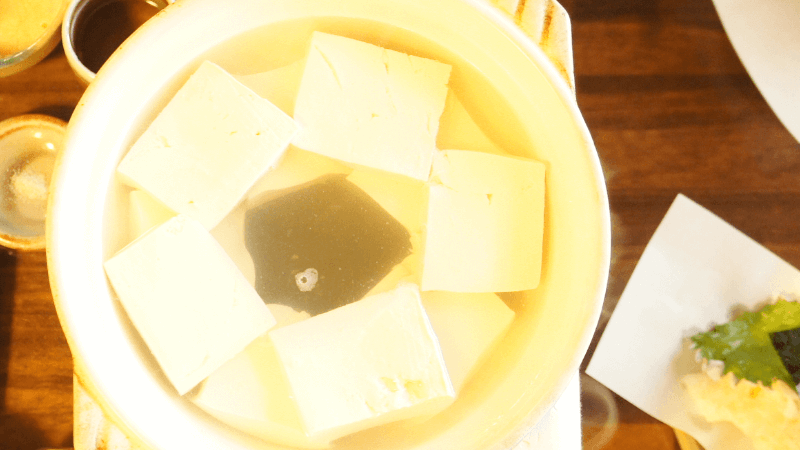 If the charm of “Junsei” is the gorgeous garden, then the signature of “Okutan” is certainly the tofu. This restaurant was established in 1635, and they have continued to hand-make tofu at the tofu factory underneath the restaurant, so you can eat freshly-made tofu at the restaurant anytime. There are two keys to making tofu: water and soybeans. This restaurant is very careful in the selection of both, and when you eat their yudofu you can really tell. For your first bite, please don’t add any soy sauce or condiments, but rather take a moment to enjoy this delicious tofu as is. Part 2Have you ever eat "Yudofu"?